Static if in the form of if constexpr is an amazing feature that went into C++17. Recently @Meeting C++ there was a post where Jens showed how he simplified one code sample using if constexpr: How if constexpr simplifies your code in C++17. I think those examples might help you to understand the static if from C++17. But for a start, I’d like to recall the basic knowledge about enable_if to set some background. At first, you may ask, why do we need static if and those complex templated expressions… wouldn’t normal if just work? is_same yields true for the type we used (string) and we can just return t, without any conversion… so what’s wrong? The compiler compiled both branches and found an error in the else case. It couldn’t reject “invalid” code for this particular template instantiation. So that’s why we need static if, that would “discard” code and compile only the matching statement. One way to write static if in C++11/14 is to use enable_if. enable_if will evaluate to T if the input condition B is true. Otherwise, it’s SFINAE, and a particular function overload is removed from the overload set. See below how we can simplify such code with if constexpr from C++17. After you read the post, you’ll be able to rewrite our str utility quickly. At first, let’s start with a simple example: close_enough function, that works on two numbers. If the numbers are not floating points (like when we have two ints), then we can just compare it. Otherwise, for floating points, it’s better to use some epsilon. I’ve found this sample from at Practical Modern C++ Teaser - a fantastic walkthrough of modern C++ features by Patrice Roy. He was also very kind and allowed me to include this example. As you see, there’s a use of enable_if. It’s very similar to our str function. The code tests if the type of input numbers is is_floating_point. Then, the compiler can remove one function from the overload resolution set. if constexpr (is_floating_point_v<T>) // << !! if constexpr evaluates constexpr expression at compile time and then discards the code in one of the branches. BTW: Can you see some other C++17 features that were used here? There’s a factory method that creates derived classes of Investment and the main advantage is that it supports a variable number of arguments! The makeInvestment interface is unrealistic, because it implies that all derived object types can be created from the same types of arguments. This is especially apparent in the sample implementation code, where are arguments are perfect-forwarded to all derived class constructors. Now, if you write make(bond, 1, 2, 3) - then the else statement won’t compile - as there no Stock(1, 2, 3) available! To work, we need something like static if - if that will work at compile time, and will reject parts of the code that don’t match a condition. Some posts ago, with the help of one reader, we came up with a working solution (you can read more in Bartek’s coding blog: Nice C++ Factory Implementation 2). As you can see the “magic” happens inside constructArgs function. The main idea is to return unique_ptr<Type> when Type is constructible from a given set of attributes and nullptr when it’s not. std::is_constructible @cppreference.com - allows us to quickly test if a list of arguments could be used to create a given type. Still, using enable_if looks ugly and complicated. 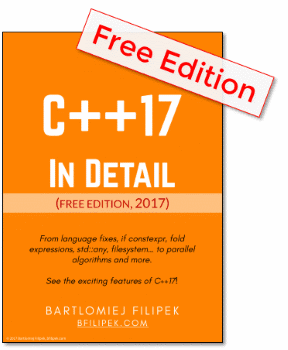 How about C++17 version? All the complicated syntax of enable_if went away; we don’t even need a function overload for the else case. We can now wrap expressive code in just one function. if constexpr evaluates the condition and only one block will be compiled. In our case, if a type is constructible from a given set of attributes, then we’ll compile make_unique call. If not, then nullptr is returned (and make_unique is not even compiled). Compile-time if is an amazing feature that greatly simplifies templated code. What’s more, it’s much expressive and nicer than previous solutions: tag dispatching or enable_if (SFINAE). Now, you can easily express yours intends similarly to “run-time” code. In this article, we’ve touched only basic expressions, and as always I encourage you to play more with this new feature and explore. C++ Fundamentals Including C++ 17 - released only recently, by well-known author Kate Gregory.